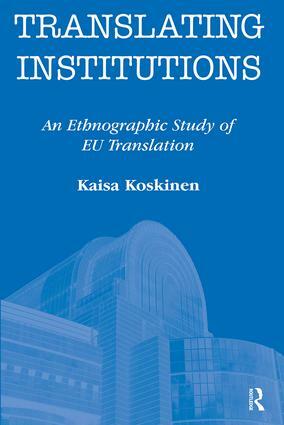 Translating Institutions outlines a framework for research on translation in institutional settings, using the Finnish translation unit at the European Commission as a case study. Because of their foundational multilingualism, the institutions of the European Union could be described as both translating and translated institutions. The European Commission alone employs nearly two thousand translators, and it is translators who draft the vast majority of outgoing EU messages. Translating Institutions sets out to explore the organizational role and professional identity of this group of cultural mediators, a group that has remained relatively invisible despite its size and central institutional role, and to use the analysis of this data to elaborate broader methodological and theoretical issues. Translating Institutions adopts an ethnographic approach to explore the life and work of the translators at the centre of this study. In practice, this entails employing a number of different methods and interrogating various types of data. The three-level research design used covers the study of the institutional framework, the study of translators working in specific institutional settings, and the study of translated documents and their source texts. This is therefore a study of both texts and people in their institutional habitat. Given the methodological focus of the volume, the different methods and data are outlined in independent chapters: the institutional framework of translation (institutional ethnography), the physical location of the unit (observation), translators' own views of their role (focus group discussions), and a sociologically-oriented text analysis of a sample document (shifts analysis). Translating Institutions constitutes a valuable contribution to the sociology of translation. It opens up new avenues for research and offers a detailed framework for the study of institutional translation.